Yesterday I looked in the fridge at a package of chicken breasts to only discover that they were turkey. Not that I have anything against turkey — I guess poultry is poultry is poultry? Anyway, my plan for the chicken breasts were chicken tenders. Because I have the tastes of a four year old. Sometimes (ok, all the time) all I want to do is stuff my face with chicken tenders, fries and mac and cheese. Sometimes (ok, all the time) I still feel like that little girl that took extreme pleasure in pink, cute things, and shiny barrettes. But, now instead of being a the mercy of a grown up, I can make my own chicken tenders. Even if I don’t have chicken. Or breadcrumbs. The turkey was a suitable substitute for the chicken, but no breadcrumbs meant no crunchy outsides. Thankfully I had an old English muffin hanging around. That and a couple of crumbs from a bag of kettle chips. I toasted up the muffin and tossed it in the food processor with the chips. Instant crispy coating! These tenders turned out quite tasty. They were super juicy right out of the oven, but as they cooled down they lost a wee bit of their moisture, so I recommend eating them right out of the oven, instead of posing them endlessly while you try to find their best angle. The English muffin got all toasty and crisp the way English muffins are wont to do. Crispy, juicy and dippable, they totally hit the spot. 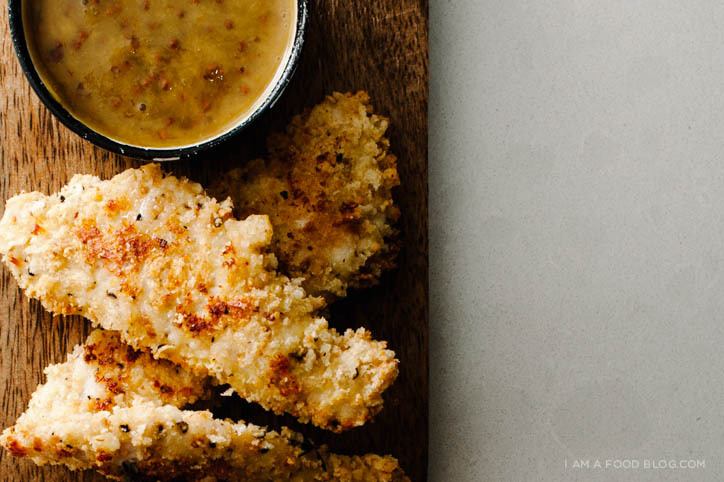 Chicken (turkey) tenders for life! Preheat the oven to 400°F. Line a baking sheet with parchment paper or tinfoil. In a food processor, blitz the english muffin and chips until they resemble coarse ground bread crumbs. Or if using bread crumbs, just blitz the chips. 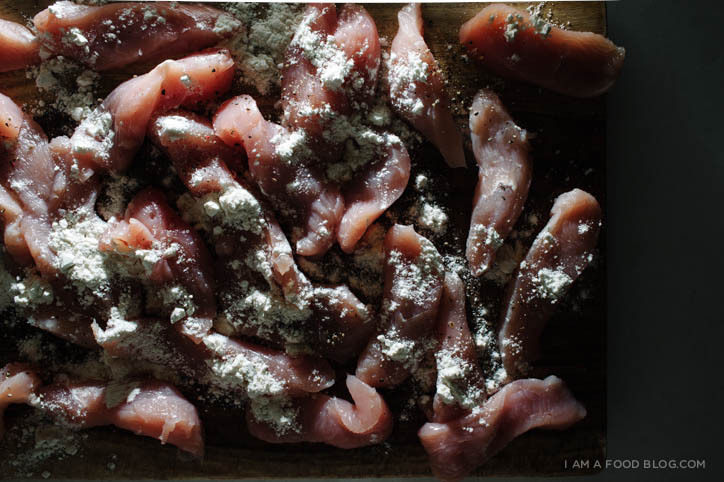 Move the crumbs to a shallow bowl and mix in the parmesan, garlic powder, thyme leaves. Taste the crumbs and add salt and pepper to taste. Lightly beat the eggs in another shallow bowl. 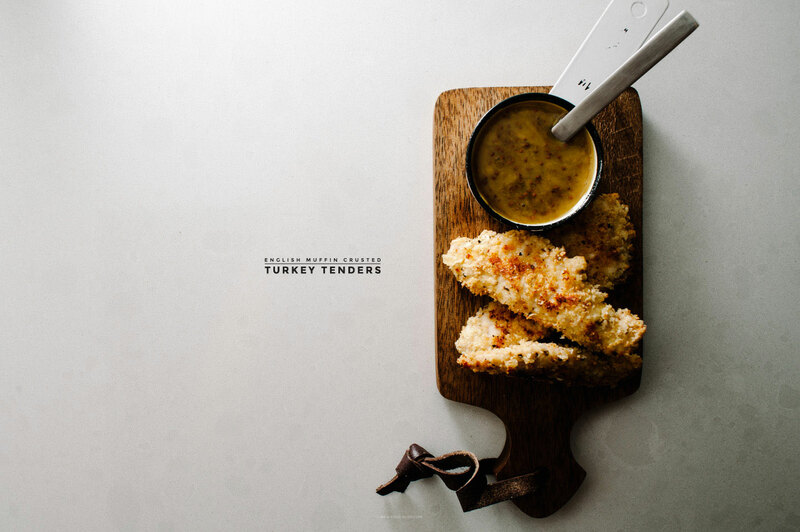 Sprinkle the flour over the turkey tenders and toss to lightly coat. Dip the tenders into the egg and then into the breadcrumb mix. 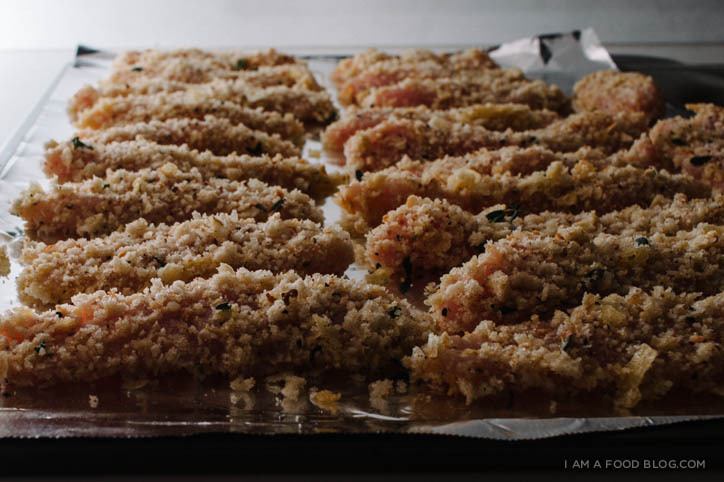 Place on your prepared baking sheet and repeat until all of your tenders are coated. Bake for 20 minutes until crispy and cooked through. Enjoy hot! 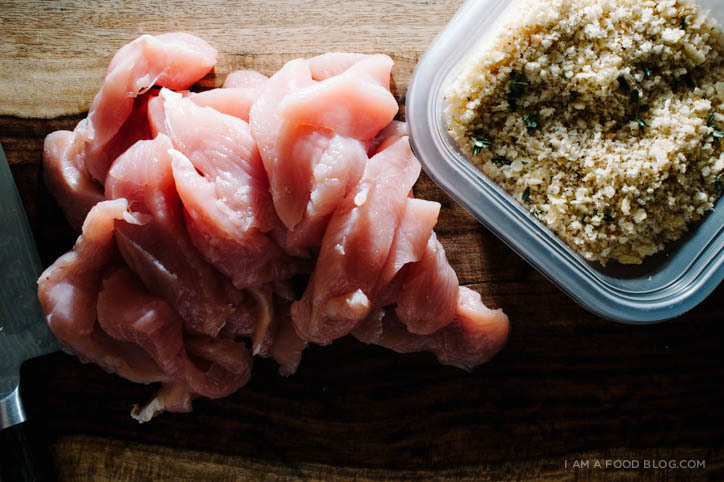 Note: If you actually have breadcrumbs or panko, feel free to use them! About 1 1/2 cups should do. These sound like the perfect lunch–or the perfect happy hour snack! Especially with spicy mustard sauce. NOM. Love your photography…and these sounds amazing! Yum. How clever to adapt a recipe to what you have on hand. Surprising what you find around the kitchen when you look. Will definitely try these.